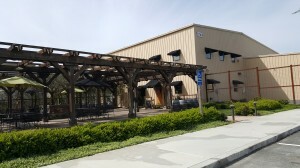 A Not To Miss Tasting In Sonoma? Balletto!!! They hadn’t been on my list. In fact, I hadn’t even heard of them before! A staff member at Gloria Ferrer (who’s become a friend because I visit so often!) told me about her favorite rosé in the world. She told me that she just couldn’t get enough of it! So … I had to check them out! 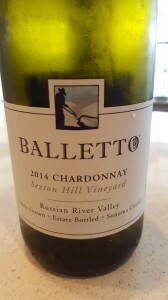 Balletto Vineyards is a family owned winery located in the Russian River Valley AVA in Sonoma County. Started as a successful vegetable farming company, in 1999 they started the shift from vegetable farming to vineyards. Today they sell 90% of their grapes to other wineries, using the other 10% producing their lovely Balletto Vineyard wines! 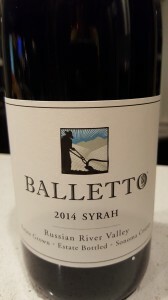 So, the day after visiting Gloria Ferrer last month, my husband and I stopped by Balletto for a tasting. I couldn’t wait to try their rosé! This pretty pink wine (made of 100% Pinot Noir) has strawberry, a touch of rose and lively acidity to balance it perfectly. I can see why my friend finds it difficult to not finish the bottle in one sitting! 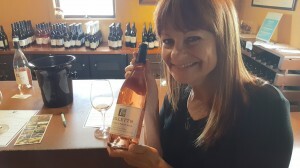 Rosé, however, is not all they do at Balletto! I also made sure to buy a couple bottles of their lovely (not too oaky) 2014 Sexton Hill Vineyard Chardonnay. They also make some rockin’ Pinot Noir (we bought some Burnside that tasted like Strawberry Twizzlers! ), Syrah and Zin! A super nice bonus is that their prices are very fair!!! Looking back I’m surprised and disappointed that I hadn’t heard of them before, but boy oh boy I’m thankful that I know them now! 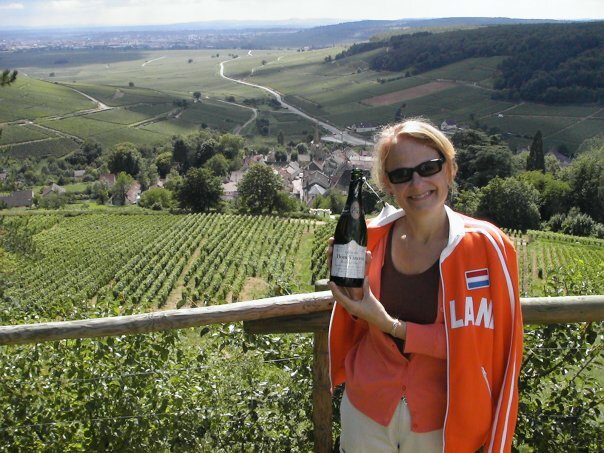 I also want to spread the word about their really nice wines and great tasting experience! Don’t only PUT them on your list … bump them to the TOP of your list! Good wine isn’t always expensive. The chatter of fine wine needing to cost a lot of money often frustrates me. Do I love some pricey wines? Sure I do. But there is nothing better than finding a well-made wine for a great price! 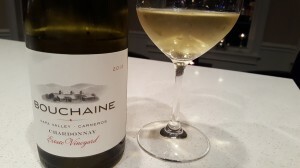 My latest “find” is from Bouchaine Vineyards & Winery in the Carneros region of Napa Valley. The Carneros AVA is actually located in both Napa and Sonoma counties and has a nice cool climate that suits Burgundian varietals very well. 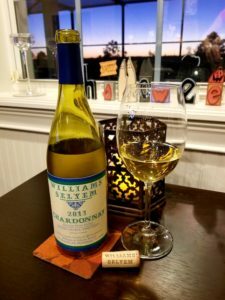 I’ve visited their winery a few times and have tried a lot of their wines, so when I found their 2012 Estate Vineyard Chardonnay for under fifteen bucks, I thought that there must have been something wrong. Thankfully the wine wasn’t wrong … I was! This Chardonnay has bright acidity with lots of lime and green apple, a touch of oak and a finish that goes on and on. 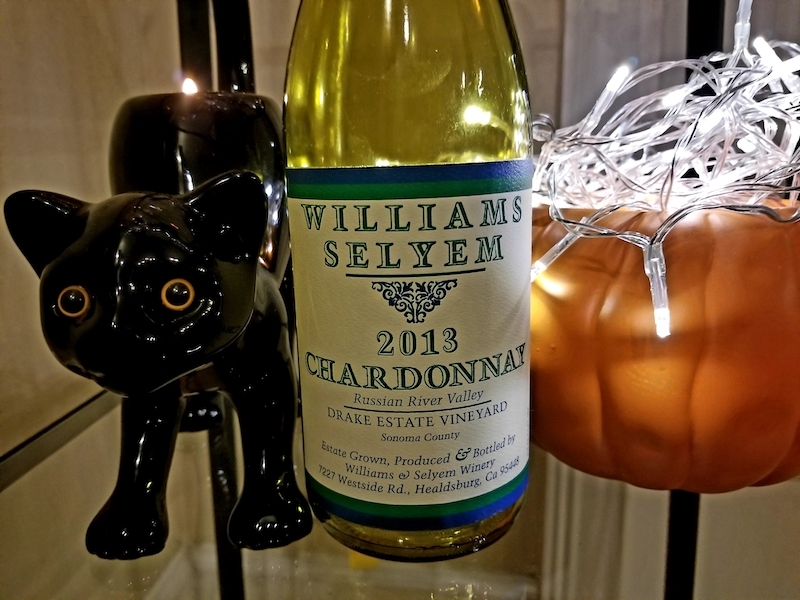 This is a great example of a Chardonnay that shows it’s true fruit and character at a very affordable price. I’m truly blown away with the value of this elegant wine. 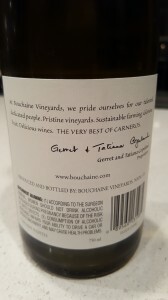 Not only does Bouchaine produce great wines, they also have a very respectable history. Bouchaine Vineyards & Winery is the oldest continually operated winery in the Carneros wine region. The winery itself is lovely, with a big barn-like structure housing the tasting room (a warm, cozy area with a beautiful fireplace). French doors off of the tasting room lead to a beautiful deck and picnic area. Sitting on their deck and enjoying the stunning view of their Carneros vineyards is was the perfect way to end (or begin!) a day of tasting, so be sure to pay them a visit the next time you’re in the Napa area! Spend Your Bones on Three Sticks, Not Stones! I get to Napa and Sonoma often. It’s common knowledge that this part of our country has some wonderful wines, but the area is also well known for some exquisite food! I’ve had some of my very favorite meals in Northern California. My husband and I adore the charming town of Healdsburg, located in the northern part of Sonoma County. Surrounded by world class AVAs such as Dry Creek Valley, Russian River Valley, Chalk Hill and Alexander Valley, the town of Healdsburg has a delightful town square. Shops, art galleries, wine tasting rooms and some fabulous places to dine surround this quaint downtown plaza area. A year or so ago my husband and I were chatting with some people while tasting at Thumbprint Cellars’ tasting room in the square. The gal with whom we were talking was headed to her shift just down the street at Charlie Palmer’s Dry Creek Kitchen, and suggested we head there for dinner and sit at her table. I’d always wanted to dine there, so we took her up on the offer! The experience was fabulous!!! The food was wonderful and the wine list sublime. They were also pouring a special wine that night, and the kind sommelier made sure our glasses weren’t left out! 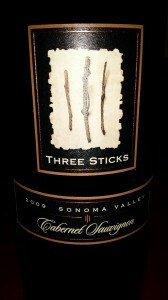 The wine was a Cabernet Sauvignon from Three Sticks Winery. 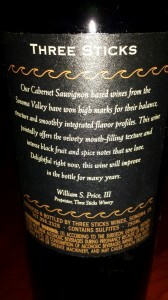 This Cab was so velvety and flavorful, with lots of fruit, but some earth too. My husband and I knew that we’d found a gem! When we returned home I got on their mailing list! With our first allocation I ordered some of their 2009 Cabernet Sauvignon. We opened a bottle last night with some friends, and it was definitely the wine of the night. With a dark ruby color, this aromatic wine has smoke, licorice and black currant on the nose. On the palate are cassis, blackberry, black cherry, soft tannins and a long and lovely finish. This wine is definitely a winner! It’s drinking well now, and will only get better with some time in the bottle. I’m glad I still have a couple in my cellar, and wish I had more. Being a member of the Society of Wine Educators definitely has its benefits. One of the perks is getting invited to some very fun wine events. This past week I was fortunate enough to attend a Zinfandel Master Class as well as a Zinfandel tasting in Orlando at the Renaissance Sea World Hotel. 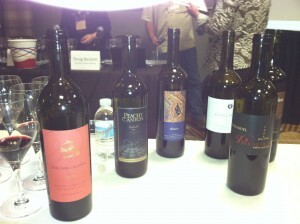 The Association of Zinfandel Advocates and Producers (ZAP) sponsored the event. ZAP was founded over 20 years ago when a small group of passionate wine pioneers and some Zinfandel loving consumers came together because they believed that Zinfandel deserved recognition as a highly respected varietal that could compete with the finest wines around the world. Today hundreds of producers and thousands of advocates are proud members of ZAP. The Master Class was wonderful. Three wine professionals from well-respected Zinfandel producers led us through the history of the varietal, as well as through their represented region and a blind tasting of various Zins from those regions. First up was Doug Becket, owner of Peachy Canyon Winery in the Paso Robles AVA. Doug’s easygoing personality and wealth of knowledge led us through the fascinating history of his winery and the interesting geography of the Paso Robles AVA. Next up was Carol Shelton, Owner and Winemaker of Carol Shelton Wines. This highly awarded winemaker expounded on some of the AVAs in Sonoma County, explaining differences in their terriors, which results in the different tastes of Zinfandel. The final speaker of the day was John Kane, the Winemaker for Rosenblum Cellars, one of the “big daddy wineries” in the Zin world. Kane manages all of the aspects of wine production for Rosenblum, from the vineyard to operations, and is the winemaker for 62 wines each year! His presentation focused largely on the Contra Costa County AVA, which lies within the larger Central Coast AVA. Following the Master Class we were invited to dine with the speakers. What great fun it was to drink their wines with lunch while hearing stories about that particular vintage and their struggles and triumphs in making the perfect wine! 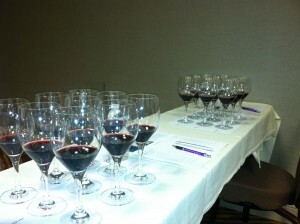 Following lunch was a tasting of Zinfandel from 16 different producers. My favorites truly did include the above wineries, along with Wine Guerrilla from the Sonoma Valley (Owner/WInemaker Bruce Patch is not only a fine winemaker, but also a very fun and personable guy) and Proulx Wines from Paso Robles.